There is an old rhyme in Marathi, ` Aga Aga Mhashi, Mala kuthe neshi..!' which can be roughly rendered as ` O my buffalo where are you taking me?!'. 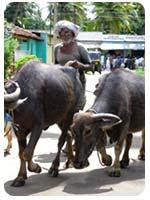 These lofty words, it is believed, were uttered by a great Man in Our Village, who blamed his buffalo for taking him where he was going because he had held on to her. In my case, the buffalo is my Good Old Asthma and see where is it taking me. It took me to Sai Mandir, Valsad daily at 5.30 in morning on my bicycle when I was studying in eleventh , way back in 1989. I did ` Alni Upwas' or Hindu method of fasting by eating things that dont have salt in them.I watered Tulsi, chanted Hanuman Chalisa and Gayatri Mantra, practised pranayama in the early nineties with a desperate hope that a miracle may happen and the disease may vanish. All this was done on the recommendation of the late Mr. Ram Sathye, a local holyman whom people called `prabhu'. Nothing worked. Prabhu is in his heaven and Sachin's asthma is deteriorating. Later, the Great Man of Valsad ( that's me) gave a shot to more or less bizarre things- swallowing Hyderabadi Fish, homeopathic pills, ayurvedic powders and also psychiatric councelling. The respected counceller believes that I am being unnecessarily fussy about asthma. Asthmatic ki gat Asthmatic jaane. And tell you what, tommorow I am headed for Dr. Newton's workshop on Past Life Therapy! Who know it may reveal that in my past livee I was choked, strangulated, drowned or decapitated and this experience may be the reason for my choking in this life. Why all of a sudden, are you headed for this bizarre new thing now Mr. Ketkar? Hope, my dear friends, hope. This buffalo is taking me places. One of the factors that has influenced me is Dr Brian Weiss, whose books have whetted my curiosity. But more important reason behind trying these things is probably not what many people would understand. Only poets can understand these things. If I could access my past lives, I would have more maal masala for my poetry and fiction! Being a poet has these occupational hazards, folks.